Thanks to Cricut for sponsoring this post. Affiliate links are used for your convenience. I hope you’ve been following along with my Cricut Question Series. You can find question 1 here & question 2 here & question 3 here & question 4 here & question 5 here & question 6 here & question 7 here & question 8 here & today we are tackling question 9 ~ Will it be easy for me to learn the Cricut Design Space software to create my own custom projects? Annnnd the answer is YES! Recently Cricut release a brand new version of it’s Design Space software. So far I am liking it a lot & finding it very easy to use. The easiest (& most fun way!) to create custom projects with your Cricut is by using different fonts. With the Cricut you can use just about any font that is already installed on your computer. Awesome! (Cricut also has some cute fonts you can purchase as well.) To create using fonts you’ll need to follow 4 steps. 1. Click the text box on the left side of your screen. 2. Choose a font. Remember it can be any font on your computer (or one of Cricut’s cute fonts that you can purchase). 3. You can make your words bigger or smaller by clicking here & dragging it to make your words bigger or smaller. 4. Double check that your font is the right size for your project. That’s it! Easy peasy! My board was just a scrap piece of 1x6 I had in my garage. So this project was totally free for me. Yay! I sanded the board really well, and then I painted 2 coats of black paint. Let dry. Now all I had left to do was take some “fake” back to school pictures! haha! 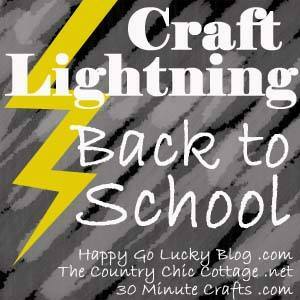 Enjoy these other back to school projects!